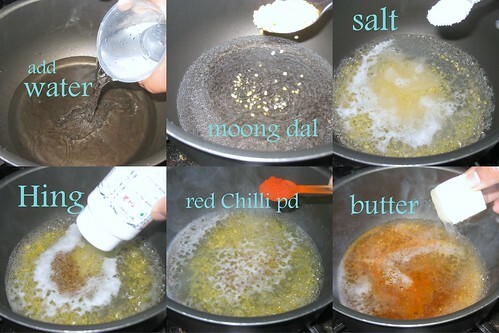 Boil water add salt,butter,moong dal,red chilli powder,cumin seeds mix well. 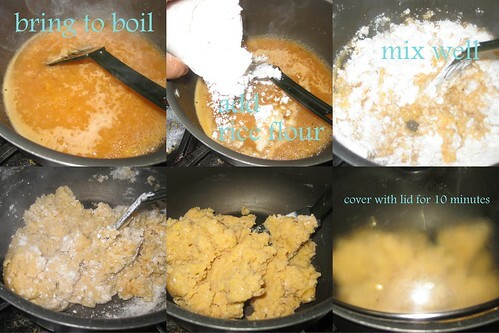 After water starts boiling ,on very low flame slowly add the rice flour and maida flour.Using ladle,combine with water by stirring it in and turn off heat immediately.Cover with lid and keep aside. Once cool ,add sesame seeds mix and knead the dough till smooth. 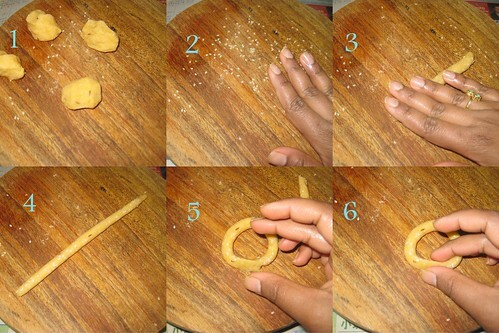 (while make the ring u can sprinkle some sesame seeds). 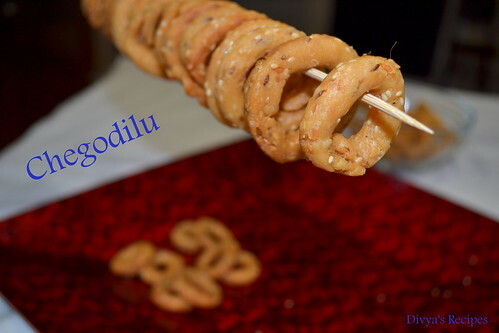 Take a small size ball of the dough and sprinkle some sesame seeds and roll into a thick rope which is approx 3 -4 inches in length and form a ring by pressing the end of the rope firmly.Prepare rings in this manner,(as shown in the image)continue with the rest of the dough until you are done with the entire batch.You can either cover it with plate to prevent the dough from getting dried. Heat oil in a wide pan,once oil gets hot gently drop the rings in batches. Initially the flame needs to be high and when rings come up the surface reduce the flame and cook till we gt golden color on the rings. 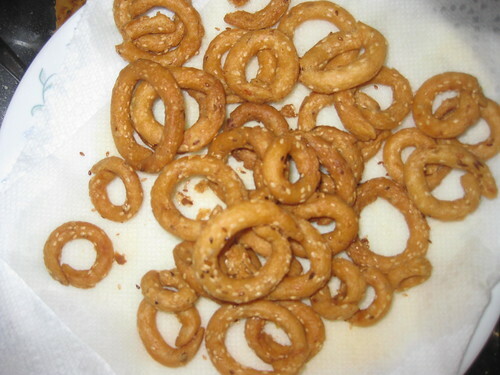 When rings turn golden,remove on a kitchen napkin and cool. Super Divya..! I bookmarked it..sure try this.. 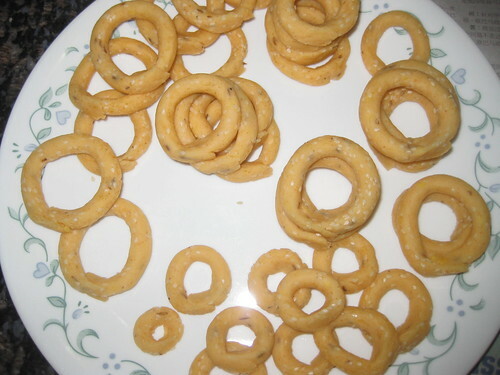 Very attractiven crunchy munchy rings,just love it. 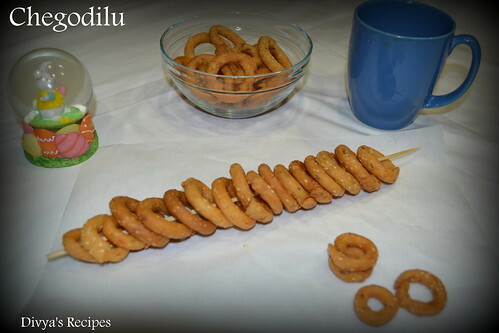 Crunchy crispy tempting chegodilu.. and all the pics are beautifully clicked.. I always knead the dough with warm water.. this recipe of cooking the dough looks different. will try it out this way next time. 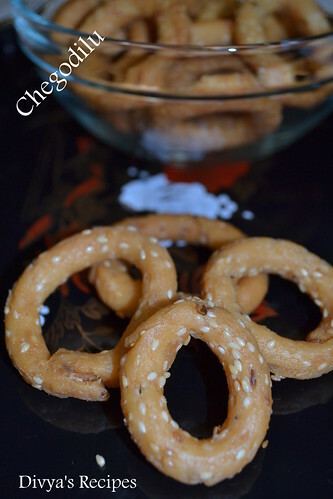 super crunchy n perfectly made rings, thanks for the detailed recipe..lovely pics! I love these cute treat, crispy and yumm. Totally admire your patience and commitment to take so many pics and explain the procedure patiently. Pics are excellent! Crispy n yummy snack dear. Wow!! So crunchy! Looks delicious!! Like this crispy crunchy munchy snack...loved it. 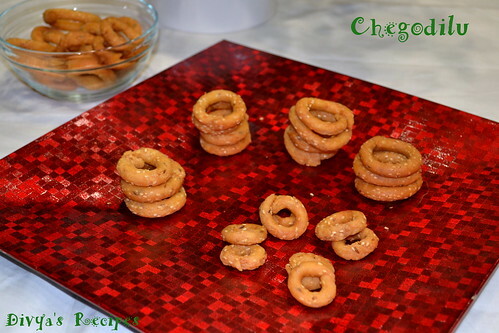 Crispy and crunchy tea time snack. 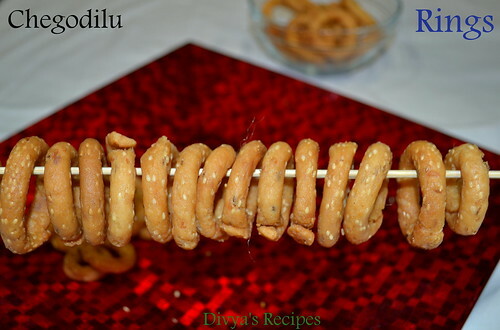 Hi Divya, delicious snack look very tempting. Love how you present it, wish I can have some now. 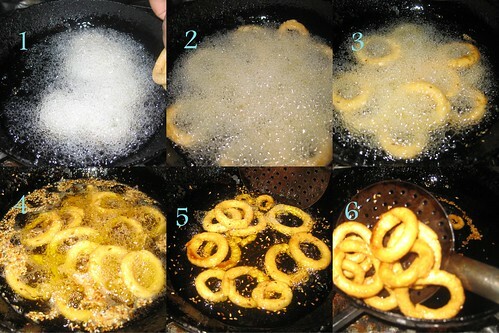 Wowwwwwwwwwwwwwww crunchy I have never tried this using 2 flours.. must do it one fine day! Nice tea time snack! Looks cute also! I don;t think I've ever had these before..great presentation! 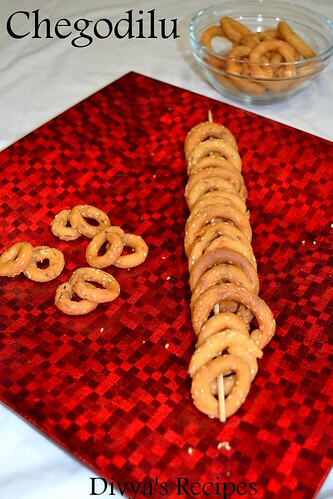 Thanks for sharing..my favourite snacks..
Crispy & exteremely tempting snack! !